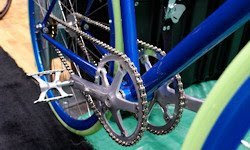 Bicycle Specialties: Two cranksets, two chains. I recently attended the North American Hand-built Bike Show (NAHBS) in Indianapolis. I do not think that there is any doubt that most of the World's finest handbuilt bikes are now made in North America. The craftsmanship on show was truly outstanding but there were also a good number of quirky bikes. Fixed wheel bikes (fixies) were much in evidence and there were some beautiful examples. The one that caught my eye though was the bike with two complete transmissions, one on either side of the bike. When I asked the guy manning the booth what the idea was I was told that the second transmission was a safety measure that would come into play should a chain break or get unshipped. Normally with only one chain of course there is no means of stopping as the modern "fixie" rider wouldn't dream of installing a brake. Without brake or chain you are completely snookered. The thought of plummeting downhill with absolutely no means of stopping is somewhat unnerving. Rather than be seen with a brake these guys install two chainwheels, two chains and two sprockets. I shook my head in disbelief. However it got me thinking about another bike I'd seen with a similar set-up but this one made a lot of sense. 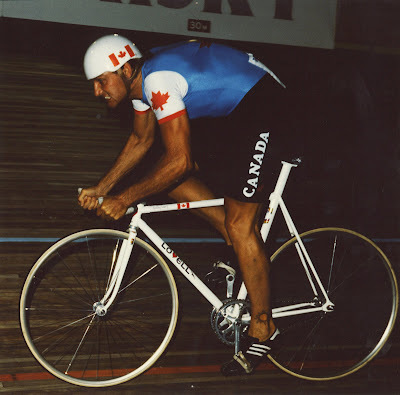 In 1982 Canadian rider Jocelyn Lovell rode the kilometre time trial at the World Championships in Leicester, England using a bike with two transmissions. His arrangement gave him two gear ratios, a lower gear to get away from the line and a higher gear that kicked in after about seventy metres. His ride in Leicester wasn't as good as he hoped for but the transmission worked well and it could not be faulted by the UCI commisaires. Jocelyn's bike had a freewheel sprocket on the normal right hand side and a fixed sprocket on the left hand side. As he moved away from the line he drove through the RH sprocket and the left hand fixed sprocket began to unscrew from the hub. It being of smaller diameter it turned at a slower rate than the RH sprocket and being on the "wrong side" of the hub it would naturally unscrew. After about seventy metres the LH fixed sprocket came up against the lockring and at that point drive was through the LH side and the RH sprocket freewheeled. The distance traveled before the higher gear engaged could be adjusted by setting the position of the lockring. The bigger the space between lockring and sprocket at the start the longer the distance before the higher gear engaged. Jocelyn's two-speed transmission worked well but it was only one of the innovations that he tried. Note that in the above photograph he is riding a low profile frame, which he had built himself, fitted with "cow horn" handlebars and an extended seat tube connected directly to the saddle. All this was quite revolutionary in 1982. Tragically he was denied the opportunity to try it to it's full potential when he was hit by a dump truck in 1983 and paralyzed. That dump truck finished the career of one of Canada's finest athletes. More about the fabulous cycling career of Jocelyn Lovell in a future blog. Mike, I'd heard about Lovell's dual chain transmission years ago, but never really understood exactly how it worked until you explained it. The one drawback I can see, and it makes me wonder how they never caught it in Leicester, is that the bike would have absolutely no braking ability because it would freewheel until the fixed cog screwed itself back up against the hub. You don't need brakes on the track! That's a really cool piece of engineering. Thanks for sharing Mike. That is quite a smart system! Thanks for sharing! About the braking... I suppose the pedaling forces during the kilo sprint where higher than when slowing down. So the cog would stay put. I've seen something similar but silly. Two freewheels coupled to two cranks on each side, with same tooth count. One engages in forward pedaling and the other when pack-pedaling. A really complicated fixed gear basically. "You don't need brakes on the track!" No, you don't need brakes per se. However, I'm sure the rules don't permit a freewheel, which is what this bike essentially is the moment you check up. I'm sure the scrutineers overlooked this at the time. Unless the parameters each side are *exactly* balanced, you see a net loss in power, expressed as a very highly accelerated wear factor. Frankly, to compare on road fixed gearing to track application is to compare apples to oranges. On track, I see an application. On road? C'mon! These are the same people who wear riding hybrids or off road machines for courier use all the time we older types were riding road bikes. No sensible engineer would propose such a system. There is a very eloquent solution to breaking. They are called "brakes". The simple coaster brake was rather inelegant, but it was designed for exactly this role, and the added weight was a very small price to pay for the safety. Breaking from the hub is a very poor mechanical advantage anyway, the torque forces put immense strain on even the best of spoked wheels. The most apt point is on the rim, where levered mechanical advantage is optimal. With regard to John B’s remarks above concerning the double transmission being eligible under the rules. Jos tells me that it did raise some commissaires’ eye brows when he turned up at the Nationals but he had had it checked by a UCI commissaire beforehand and after studying the rules he was allowed to start. There was also no problem at the Worlds in Leicester. Regarding braking. Of course, as OAP says, once the LH sprocket is up against the lockring it is so tight that it operates like a regular fixed wheel. And of course, cycling is the time when many of us think the best, and Mike's article on Lovell's brilliant (and incredibly simple) acceleration gear kept resonating to me. The principal was like an elephant in the room, extremely familiar, but I couldn't place it. Rocket assisted launch on airplanes? Nah...similar, but not it. It's far closer to home than that! It's the Bendix starter mechanism of an automobile, in many respects, save that electric starters are automatically reset (a spring throws the armature back into the starter housing, thus disengaging the splined shaft from the toothed edge of the engine's flywheel). It is not an exact analogy, but it allows a view as to what was happening in Lovell's case. It was a starting mechanism more than a dual gear. I couldn't help but stare at that photo, in the enlarged format, and couldn't discern the details at the wheel hub as per tooth numbers, but it appears his left crank wheel is slightly larger than the right. The camera angle could be misleading on that, but I'd be intrigued to know what his overall gear ratio was between the two modes. Absolutely wonderful stuff! It could not be much more simple and yet extremely elegant in concept. His crank spiders look to be ground down and brushed too, ostensible to cut some of the weight surplus to need. I wonder if Mike would be up for writing more on the Sturmey-Archer epicyclic system (now even more advanced with Sachs and Shimano). I've often viewed the fixed gear (or their single gear ratchet cousin) street crowd as missing a real opportunity! The internal hub w/coaster brake design as a courier machine. Gears are wonderful things, rofl...as are brakes, and I still think the vast majority of leisure and commercial cyclists would be far better off with what was developed eighty years ago! Sturmey Archer was sheer genius. I found a magazine article that said that Lovell learned to build bikes with Marinoni, and that Lovell in turn taught the craft to M. Mulholland of Cyclops in Toronto. And Marinoni got it from Marc Rossin! Fascinating article in today's Washington Post on "fixies". It's just gone up, and already, there are 12 comments there. [What a profile they cut, slicing through the city: gorgeous, exotic, dangerous. You see them parked like emaciated steeds outside the coolest clubs.